The service we offer here at the Los Angeles Pool Table Movers includes proper teardown, safe transportation and professional pool table setup with expert leveling, recovering with the existing material is possible if it is in good condition. Although, the best time to refelt with new cloth is when the pool table is in pieces. Our team of trained pool table movers is experienced in all types of pool table moves from start to finish and we make sure your table is in the best playing condition it can be when we finish. We properly setup new and used pool tables all over the Los Angeles area. We can also recover your pool table as well with new material if you desire for an additional cost. Guaranteed satisfaction and leveling on applicable pool tables. Complete pool table moves from one house to another and we service local businesses also. We provide pool table services and repairs also in Santa Monica, Torrance, Long Beach, Anaheim, Riverside, San Bernardino, Ontario, Oxnard, Thousand Oaks, Lakewood, Orange, Santa Ana, Huntington Beach, Irvine, Newport Beach, Lake Forest, Fontana, Redlands, Moreno Valley, Santa Clarita, Camarillo, Palmdale, Lancaster, and more around Los Angeles. Our team of pool table movers provides new and used pool table installations all over the area. We come to your home, unpack if necessary, cover rails, seal the seams with beeswax and professionally level all 3 pieces of slates using precise leveling equipment. We work with pool table installers in many areas and we have been exposed to the common practices in the pool table service business at levels that no other company could possibly understand. We are the largest pool table service company in North America and our mission has been giving the client the best and most honest service possible. Our pool table installers combined with our team of professionals gives our clients a risk-free service and we are completely dedicated to raising the standards in the billiard service industry. We will break down your table or move it from storage facilities, your garage or just another room in the house. If you need carpet laid do not try to move your pool table! Let us handle that 800 pound monster for you. Taking the table out of storage? 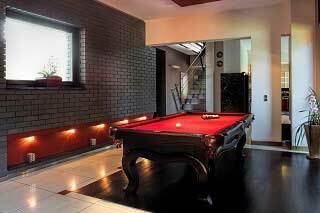 We can professionally install the pool table for you. Shopping for a pool table for sale? Check our classifieds for recent listings of pool tables for sale in Los Angeles. Our professional pool table installers works with standard woolen pool table cloth and tournament grade worsted materials as well. Also, if you’re not sure which size of a pool table to pick, check out a chart we have put together with the proper pool table room sizes to verify the pool table that will properly fit in the room where you want it setup. The SOLO Pool Table Movers of Los Angeles is backed by the only National organization in our industry. As Members of the ABIA, we are the only company in the area to offer you an exclusive 1 year service guarantee IN WRITING and issued by the American Billiard Installers Association.